If You Find Joy ……. If you find joy, grab it with both hands and run with it. Some of it will spread as you run and some of it will still be with you. The joy that is spread will always be around to grab it again. I find joy in quilting. It fills me up and anchors me. Here is a great design in the frame today. Hopefully, the quilting will take awhile as I am having so much fun quilting it. The quilting design is a Freemotion swirl. Grab that joy and run. Seems that those days I have a list of things to do, are days that I get very little done. I try to be organized and work through the list of what needs to be done, what should be done, and what I would like to do. Today was a day of nothing getting done that was on the list. So, tomorrow will be even more packed. Here is an absolutely darling quilt I just finished for a client. It is going to be a very special gift, given from the heart with much love. The pattern is great and uses a wonderful selection of fabrics with a bit of red outline stitching that sets off the pattern very nicely. The quilting was a pantograph of clouds and stars that really connected with the flavor of this darling piece. It inspired me to pull some fabrics for a new piece I would like to do. I do love inspiration! There I go again, wanting to start something when I have my list of things to do. I did pick beans from the garden (it is beginning to end its production of veggies finally). And I did work on the two Halloween panels I started. I was going to show you what I completed today on the panels, however, I did not get far. The frustration begins to raise it’s ugly head and then I have to remember that some days are more productive than others. If you wish your days away, time flies and you lose. Here we are full circle……enjoy your days, make awesome quilts, pick beans from your garden, and “Make What You Do Today Be Enough”. The weekend went by so fast. My son came to town from Portland. He designs some fabulous furniture and was delivering a bed. I was able to have dinner with him and spend a little time visiting. I am so proud of him and miss being able to see him more frequently. Guess when time ticks on, kids grow up and I am still busy! Here is the Rag Quilt I was quilting for a client. It will definitely look different when she washes it and all the raw edges fray. Finished another piece for a client but forgot to take a picture. I was too busy and just plain forgot. It was a darling piece. Well, Mia and I have a lot to do today. Working on the Halloween panels again. I have been very busy in the studio of late. I am trying to stay on top of the quilts from my clients as well as continue to work on my Halloween panels I showed you. 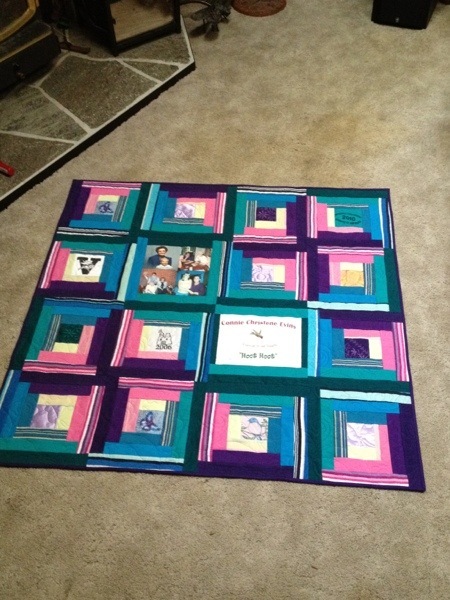 Here is a Memory quilt I just completed. It is from t-shirts that belonged to a very special person. I know it will be very loved. Today was full of things to do, I did not accomplish much. But what is new? It feels wonderful to have my time full. I cannot understand or relate to others who are bored. Not one of those feelings I ever have had. My darling daughter is an Editorial Assistant for Ruemag.com. What a great sight to look on line and see her fab face smiling back. Congrats darling! This is a rag type quilt made out of so many scrap pieces. What a good way for my client to use up that fabric. I love scrap quilts. It it seems like every time I touch my scraps, they multiply like rabbits in heat. I should seriously consider not making scrap quilts, I guess. Any way, thought you might like to see one of the projects in the studio today. Well, after much work and many bad words, I have uploaded new photos to the Photo Gallery. I do hope that they all show up as I intend them to show up. You never know when you are messing around with my website. This was a great quilt that I taught as a class. I still have another one in a different color to finish and then I will share it with you. This is also one one my favorite quilts to do….. What with Fall rapidly approaching, maybe this is one I should hang on the wall. I guess that most of my quilts are favorites. Some took more time than others. Some were easy and some were difficult. All were times spent doing what I really enjoy, working with fabric, quilting, quilting or quilting. Remember that the Photo Gallery link is located on the right hand side of the page under where you subscribe to my blog. This panel is definitely cute, but most of the fabric I pulled is for bolder, brighter panels. I would need to pull out a whole different batch of fabrics for this one. (Not that I do not have the fabrics to choose from, I just do not want to pull more for this one right now.) I really want to spend time getting a couple Halloween panels made into quilts before the Halloween season is here. That would be a novel way to do things. Usually, I burn the midnight oil to get something done on time, never ahead of time. Now each of these panels have promise. I just need to get my creativity into gear and think about how I will work with these panels. I also need to work with the projects for my clients. I am not forgetting about the outside work I need to get done as well. So where or what do I begin, continue, or just forget about? If the weather wasn’t so nice, I would not even consider working outside. Maybe I will just go outside and contemplate. 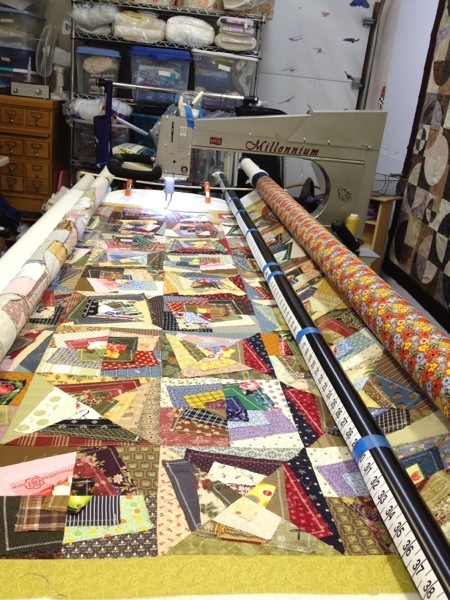 “Behind every quilter . . . . is a huge pile of fabric”. Enjoy your day, sue. As September rolls around, I am caught up in the idea that I need to organize and clean up things in preparation for some mass quilting and sewing projects. I have gone through several closets and have begun to put my fabric into some sense of order. (What a huge task, or joke depending on how you look at it). I use the plastic tubs for keeping projects and respective patterns together. I also have fabric that I have gathered for future projects. Does it matter that I am not exactly sure what the future project will be? I think not. I think I have a case of “My mind has so many ideas and projects, my body does not have equal time or energy”. I do get a lot completed but I still have more to do. Then the fall cleanup time is also here. Trying to divide my time is such a chore. I am torn between working outside on such great, warm September days, or sewing and quilting. I tell myself that I will have time later to sew when the weather cools and the outside is ready for winter. I never have enough time then, what with the holidays and shoveling snow. So…. Arn’t these just darling fabrics? Of course I will need to think about what I am going to do with them. I am determined to make a couple of quilts this year while I still have the desire to use them…..maybe I will even stitch up a couple of Halloween kits that I have found in my closets…..(only found a couple though).